Santa Rita was founded in 1880 and has been growing and evolving locally and now enjoys extreme success in global markets. It makes a range of styles; from simple everyday drinking varietal wines to complex premium styles. 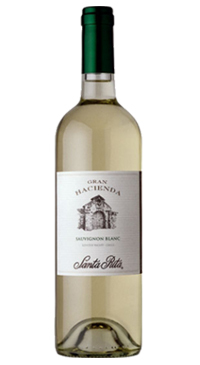 The Gran Hacienda line offers excellent varietal character at an amazing value. This is a classic crisp and refreshing white Sauvignon Blanc. Its fruity aroma of citrus blossoms and peaches is well balanced by delicate herbaceous undertones. Fruity and floral characteristics are enhanced by a pleasant acidity and a clean finish.